I was on my way to CCA's parking this morning. It's my second time to drive along this street, but it's also the first time that I saw this milkshake hub here. After seeing the signage, I immediately went to the conclusion that I'd have this checked out by the end of the day. That's what I did. Come lunch time I told my classmates that I saw this restaurant near Starr's and we could have lunch there. I had them head straight to the restaurant while I visit Starr's. The place is small but pretty neat, and the interiors look cozy, with some stools shaped like donuts with holes in the middle. I asked the ladies at the counter what they would recommend and they pointed me to their oreo oreo pancakes milkshake. That's what I ordered for P145. I also got full from this milkshake that I didn't get to finish my lunch. I'm not hard to please when it comes to milkshake. I just like it thick and creamy without having a hard time sipping through the straw. Starr's was able to meet those. 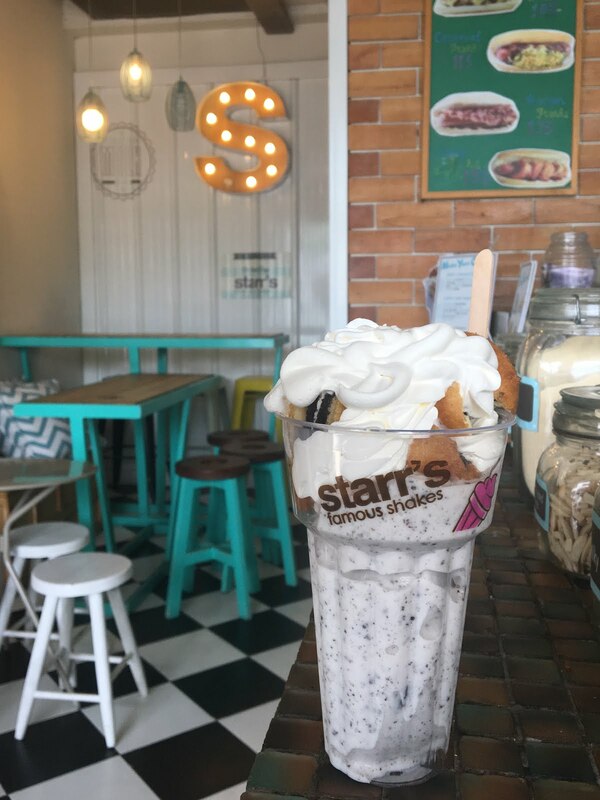 So, I'm really happy that I finally got to try Starr's famous milkshake! There are branches here in the south and I can't believe I had to travel to Katipunan just taste their milkshake lol!